One of Italy's five autonomous regions (along with Val d'Aosta, Trentino-Alto Adige, Friuli-Venezia Giulia, and Sardinia), Sicily is the largest island in the Mediterranean and has been inhabited continuously since 10,000 years ago. Its cuisine is the result of Greek, Arab, Spanish, and French influences over the centuries, with elaborate antipasti, exuberant pasta preparations, complex rice dishes, stuffed and skewered meat and fish preparations, and honey- or almond-based sweets gracing the family table. You can use a short pasta, such as rigatoni or ziti, instead of tagliatelle if you prefer. Make the sauce: Bring 5 quarts of water to a boil. Add the cauliflower and cook 3 minutes, or until crisp-tender. Drain, reserving the cauliflower cooking water. Warm the olive oil in a large, deep saucepan over a medium flame and add the onion, garlic, and chili pepper. Cook until the onion is translucent, about 5 minutes. Add the tomatoes, salt, pepper, and boiled cauliflower florets. Cover and cook 20 minutes, stirring once in a while. Uncover, add the raisins, pine nuts, and basil, and remove from the heat. 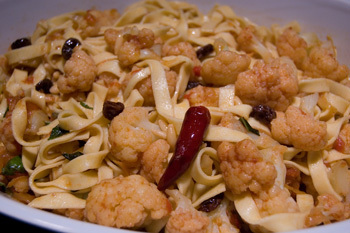 Make the tagliatelle: Return the cauliflower cooking water to a boil. Add the salt and the tagliatelle and cook until al dente. Drain, reserving 1/2 cup of the cooking water. Try tuna instead of swordfish for an equally delicious dish. The bundles can be oven-roasted in a preheated 425 degree oven instead of sautéed for 15 minutes. Combine the onion, garlic, parsley, raisins, pine nuts, capers, and egg in a bowl. Top the swordfish evenly with the mixture, then roll into bundles to enclose and spear each bundle with 2 toothpicks. Heat 2 tablespoons of the olive oil in a 12-inch skillet over medium-high heat. Add the bay and sage leaves and cook 30 seconds. Add the bundles and cook until browned lightly all over, turning to cook evenly, about 5 minutes. Remove the bundles to a plate and discard the toothpicks; the bundles should hold together. Season the bundles with the salt and pepper and set aside. The rich sauce in which the meat bundle slowly braises is often served with pasta in Sicily as a first course; the bundle is then sliced and served as a main course following the pasta. Place the beef on a cutting board. Top with the Pancetta, Pecorino, rosemary, parsley, garlic, and sliced onion, and season with ½ teaspoon of the salt and ¼ teaspoon of the pepper. Roll tightly to enclose. Tie with butcher's string to prevent the bundle from unrolling as it cooks. Heat the olive oil in a 14-inch sauté pan over a medium-high flame and add the bundle. Sear on all sides until golden brown all over, about 10 minutes, turning often. Add the minced onion, carrots, and celery, and season with the remaining ½ teaspoon of salt and ¼ teaspoon of pepper. Cook until the vegetables soften, about 10 minutes. Pour in the wine and cook until it reduces to one-third of its original volume and loses its sharp smell. Add the tomatoes and broth. Bring to a boil, cover, and lower the heat to medium-low. Cook for 2 hours, or until tender, turning once in a while and adding water if needed. 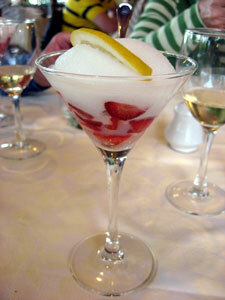 Simplicity itself: a bracing lemon sorbet (store-bought is fine) served over fresh, sweet strawberries. The colors are glorious, the preparation minimal, and the flavors addictive. In winter, use canned Italian plum tomatoes instead of fresh, and substitute red wine for the white. Sicilian home cooks make busiati (a short, hollow spaghetti) by hand to pair with this sauce, and that is the pasta pictured here; to make the pasta by hand, click here. Heat 1 tablespoon of the olive oil in a deep 10-inch sauté pan over medium-high heat. Add the garlic, onion, and basil and cook 5 minutes. Add the pork and cook until lightly browned all over, stirring often, about 10 minutes; this step is important--if you rush and the pork is not sufficiently browned, the ragu will taste weak. Add the wine and then, after 5 minutes, the tomatoes, 1/2 teaspoon of the salt, and the pepper. Cover and cook over medium-low heat for 1 and 1/2 hours, or until the pork is very tender You may need to add a bit of water if it evaporates in order to prevent scorching. Bring 5 quarts of water to a boil. Add the bucatini and the remaining 2 tablespoons of salt, and cook until al dente. Drain, reserving 1/2 cup of the pasta cooking water. This is the dish Gianna prepared for us the first night we met, a pasta she grew up loving thanks to her mother, who hailed from Siracusa. 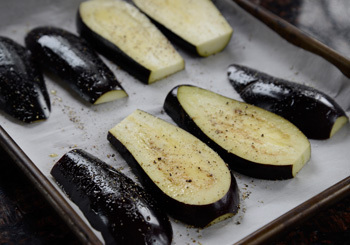 The essential thing is to fry the eggplant in plenty of extra-virgin olive oil after purging it to get rid of the bitter juices; roasted or sauteed eggplant just won't taste as succulent or be as silky in texture. Toss the eggplant with 1 tablespoon of the salt in a colander set over a bowl. Set aside to purge its bitter juices for 30 minutes, then rinse and blot dry with paper towels. Meanwhile, preheat the broiler. Place the pepper halves, cut side down, on an aluminum foil-lined baking sheet. Broil until blackened, about 20 minutes. Wrap in the foil; cool 15 minutes, unwrap, peel, and cut into strips. Heat the olive oil in a 14-inch skillet over a medium-high flame. Add the purged eggplant and fry until softened and silky, about 10 minutes, stirring often. Fold in the anchovies, capers, and garlic, and cook 3 minutes, still stirring. Stir in the tomatoes, basil, olives, roasted pepper strips, and 1/2 teaspoon of the salt, and cover. Reduce the heat to medium-low and simmer 15 minutes, stirring every few minutes and adding a little water if the sauce dries out too much. When you are ready to serve, bring 5 quarts of water to a boil. Drop in the vermicelli and the remaining 2 tablespoons of salt, and cook until the vermicelli are al dente, about 5 minutes. Drain, reserving 1/2 cup of the pasta cooking water. Bring 3 quarts of water to a boil. 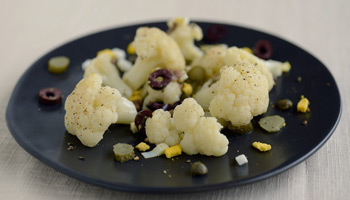 Drop in the cauliflower florets and 2 tablespoons of the salt; cook until tender-crisp, about 3 minutes, then drain and shock in ice water; drain again. Some things are just meant to be. You can map out every last detail of your holiday before ever stepping on a plane, but when it comes right down to it, the most memorable moments of any vacation just can't be planned ahead--like when you'll be lucky enough to meet an amazing cook who will not only welcome you into her home for dinner on a windswept night in Sicily, but ask you to cook alongside her in a kitchen that smells like freshly picked lemons and jasmine. 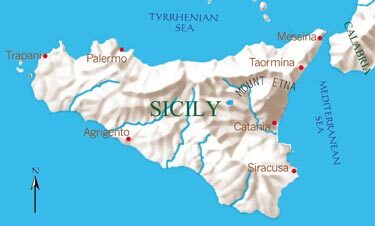 Every time I think of Sicily, I remember my first meeting with Gianna: short and round, with curly gray hair that clung to her head like a woolen cap, she wore a flowered pink housedress and spoke a tight Sicilian dialect I had to strain to understand. My parents' friends, Monica and Maurizio, introduced me to Gianna: she lived next door to them--two Milanesi who preferred to summer in Sicily than in Liguria or Piedmont, like most of their acquaintances back in Milan--in their rented apartment in Taormina. Monica and Maurizio knew I was on the hunt for traditional Sicilian recipes to include in my cookbook, and wanted to help me in my quest by making sure I got to know their neighbor, whose reputation as a formidable cook spanned far and wide through the maze of medieval streets that stretched beneath their home. My husband and I arrived in Taormina intent on tasting a number of Sicilian specialties: Bottarga, a salty, pressed tuna roe that is often shaved over pasta; Caponata, fried eggplants flavored with a touch of vinegar and sugar; and almond paste cookies, legendary Sicilian sweets whose supple texture eludes even the most skilled of Italian bakers. We came equipped with cameras and notebooks, appetites and questions, and an agenda outlining every day of our weeklong journey. But the moment we met Gianna, we dropped our pens, put down our cameras, and experienced a side of Sicily we had only dreamt about: the insider's Sicily. Not ten minutes after we first shook hands, Gianna whisked me into her kitchen, tied an apron around my waist, and started chopping vegetables for dinner. As we roasted peppers over an open flame and fried cubes of eggplant in golden olive oil, I learned that Gianna was born in Palermo, the capital of Sicily and its busiest city, in 1932. Her mother was from Siracusa, her father from Noto. She was a seamstress by trade, like her mother, and put her three sons through school by making dresses for the local women after her husband died of a heart attack in 1955. Gianna's life, like that of many Sicilians, was not an easy one: she worked hard, saved, and was happiest when she talked about her grandchildren. Her youngest son, Enzo, had moved to Taormina after he got married; Gianna, who had recently retired, moved in with him so she could take care of the kids while Enzo and his wife--he an accountant, she a sales clerk--worked. Like most Sicilian women, she defined herself by her usefulness to others: she cooked, cleaned the house, played with the kids after school, and still sewed un po' ("a little") to help with the rent. "Things are much better now than they were when I was your age. When I was your age," she said, throwing a fistful of emerald basil into a pot of bubbling tomato sauce, "there wasn't that much work. A lot of the young people were leaving the country and moving to the cities in search of work. I had to scramble to feed my kids… But we got by, and now my three boys have all gone to university, and they're earning more than I ever hoped they would," she concluded, then stooped to select a lid for the pot and lower the heat under the sauce. Gianna was showing me how to make Vermicelli alla Siracusana, a family recipe she prepared every Sunday or whenever important guests came for dinner. As an American journalist, I fit into the latter category. "My cousin Anna moved to America when I was twenty. Chicago. I get postcards from her every Christmas, but her kids don't speak Italian, and she hasn't come to visit in years. I went to see her after my husband died. The food in the Italian restaurants was so bad--it was all heavy tomato sauce and burnt garlic, no one knew how to make a decent Sfincione," she said, shaking her head sadly. "I think Anna forgot how her mother cooked--she was the best cook in Palermo, legendary for her Pasta con le Sarde--or maybe it's just that the ingredients don't taste the same in America. Maybe you can show the Americans how we Sicilians really eat." Like many Italians who visited America decades ago, Gianna had only gotten to know an America whose spaghetti and meatballs was synominous with Italian cuisine. As we stirred and diced, fried and strained, I tried to give her a more accurate picture of contemporary Italian cooking across the ocean. The restaurants where Anna had taken Gianna had served up the food of impoverished Sicilian immigrants who, stunned by the American abundance of raw ingredients and the relative ease with which they could obtain them, had transformed a peasant cuisine into one of excess. They had taken all the Baroque elements of true Sicilian cuisine--the long-simmered meat sauces, the fanciful presentation, the penchant for combining sweet and sour--and created a hybrid that was purely Sicilian-American. "If you come to America now, you'll find it's changed. 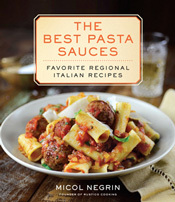 People are discovering what Italian food is all about: simplicity and purity of flavors," I told her. But Gianna looked at me, unconvinced, an image of heaping platters of overcooked and oversauced spaghetti with meatballs still in front of her eyes. "Maybe you can show the Americans how we Sicilians really eat," she repeated, her mantra for the rest of the night. The following morning, Gianna escorted us to the Greco-Roman theater with the pride of a parent showing off a child's painting. "The best time to come here is at sunset. There's nothing more beautiful than watching the sun go down behind the Etna and imagining what the Greeks and Romans talked about as they sat on these very steps," she murmured, staring into the distance. 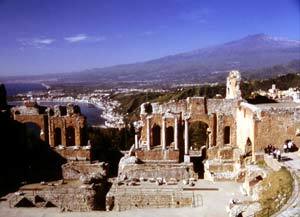 Taormina's amphitheater, built in the third century B.C. 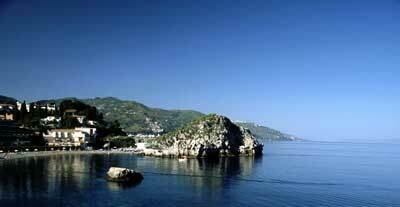 by the Greeks, was later expanded by the Romans and remains one of Sicily's largest classical structures. Summer concerts are still held there, as well as at the Greek amphitheater in Segesta, an abandoned archaeological city some 50 miles southwest of Palermo. After taking in the surreal beauty of the coastline from our perch in the theater, Gianna led us to her favorite pastry shop near the main piazza to pick up almond pastries for lunch. 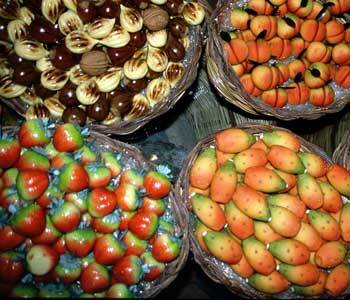 "Pasticceria Minotauro makes the best almond paste sweets. Their pasta reale is so soft and fragrant, you'd swear they just picked the almonds from the trees yesterday," she pronounced, selecting from a resplendent array of pastries. We ate a simple lunch that day: the Caponata I had been hankering to try on Sicilian soil, some crusty semolina loaves sprinkled with sesame seeds, a platter of sheep's milk cheeses, and the almond pastries from Minotauro. As evening drew near, we walked to the historic center of Taormina and watched the sun set behind Mount Etna. Tufts of pink smoke rose from the volcano's gaping mouth and made me reconsider the wisdom of our decision to visit the very next day. 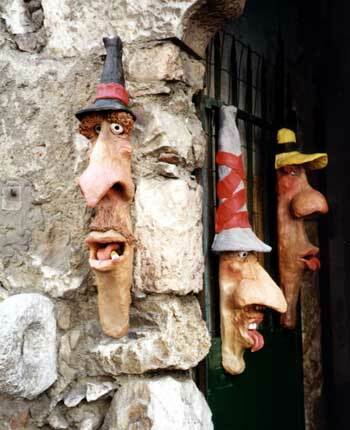 We left Monica and Maurizio's home at sunrise. We had said our good-byes the previous night--no need to wake Gianna, we thought--but as we loaded our suitcases into the car, she shuffled to the window, waving a small flat package in her right hand. "I packed the almond pastries for you. Come up, you'll get hungry on your way to the Etna… You'll need something in your belly to remember me by!" Like we could ever forget Gianna, almond pastries or not. Tucked in the countryside between Taormina and Mount Etna is the Alcantara Gorge, a massive rocky chasm surrounded by lush woods that we might have missed had it not been for Monica, who showed us photos from a recent day trip she and Maurizio had taken. We got there quickly--a mere half hour by car as we munched on Gianna's cookies--then spent an hour padding in its cooling waters before we headed to Etna. Europe's highest active volcano at 10,991 feet, Etna was gurgling and smoking as we rode the bus up to the observation point. We were cool in our sweatshirts and windbreakers, despite the fact that it was mid-summer. In Greek mythology, Etna was the home of the Cyclopses; eruptions were thought to be the breath of the giant Enceladus, earthquakes his movement. The oldest lava is thought to have erupted 300,000 years ago, and indicates that Etna may have started as a submarine volcano and then grown above sea level. Standing near the mouth of the volcano, we could feel the power within the mountain. Etna has erupted nearly 200 times since 1500 B.C. (in fact, just this October, black ash spewed from Etna, covering highways, rivers of lava ran down its slopes, and a series of earthquakes rattled the city of Catania, leaving thousands of people homeless and afraid). Despite this, locals still refer to the volcano as il gigante buono ("the good giant"). This nickname says a lot about the stoic nature of Sicilians, who have had to endure much--from foreign invasions to famine--through the years. We left the good giant that afternoon for Siracusa, where we would visit the archaeological sites before moving on to the Baroque buildings in Noto, the Roman villa and mosaics of Piazza Armerina, the Greek temple of Agrigento, the capital city of Palermo (for a taste of Panelle, chickpea flour fritters, at the boisterous Vucciria Market), and the beach in Cefalù. Every temple we stood in, every castle we explored, every street we walked, and every dish we savored became a part of the mosaic of Sicily for us: dazzling and brightly colored, infused with energy and goodness--like Gianna in her lemon-scented kitchen just above the medieval streets of Taormina. First published in Seabourn Club Herald. Best known for its dessert wines, Sicily has had an important oenological tradition since antiquity. The island's most symbolic wine is Marsala, a dry, semi-dry, or sweet fortified wine vinified mostly from Grillo, Catarratto, and Inzolia grapes in and around the town of Marsala and classified according to age; the Fine is aged one year, Superiore two years, Superiore Riserva four years, Vergine five years, and Stravecchio ten years. Sicily's two other famous dessert wines are Malvasia delle Lipari, an amber, grapey, sweet wine from the Aeolian islands, and Moscato di Pantelleria, a sweet, golden wine obtained from Zibibbo grapes. Sicily's proudest red wines are Cerasuolo di Vittoria, vinified from Frappato and Nero d'Avola, with a full, intense bouquet, round, harmonious flavor, and good aging potential; Faro, medium-bodied, with a delicate, airy, persistent bouquet and ethereal, dry, harmonious flavor; and Nero d'Avola, full-bodied, ruby-red, and moderately tannic. The most prized white wines are Bianco di Alcamo, which offers a neutral nose and dry, slightly grapey, fruity flavor; Catarratto, with a decidedly full, spicy character; Grillo, lightly citrusy, earthy, astringent, and ageworthy; and Inzolia, fruity and intense with a heady fragrance. For more on Italian wines, click here. Archimede, Via Gemmellaro 8, Siracusa, 0931/69701. The pasticcio di pesce should not be missed at this elegant restaurant. Caflish, Viale Margherita di Savoia 2, Palermo, 091/6840444. Palermo's most famous pastry shop, founded in 1800; try the best gelo di melone. Don Camillo, Via Maestranza 92/100, Siracusa, 0931/67133. Sea urchin and other Sicilian favorites can be sampled at this sophisticated restaurant; order the zuppa di pesce when you call to reserve. Il Ristorantino, Piazzale Alcide De Gasperi 19, Palermo, 091/581628. Traditional restaurant with a sophisticated approach to Sicilian cuisine; try the insalata di rucola, aragosta e gamberi. 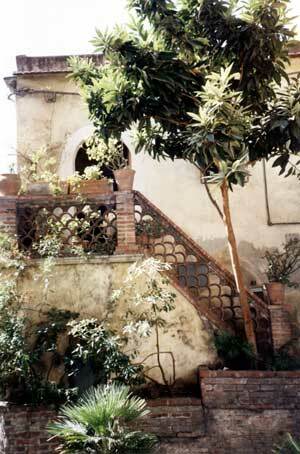 La Giara, Vico La Floresta 1, Taormina, 0942/23360. 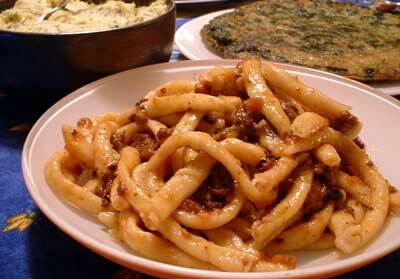 Traditional recipes revisited; the cannolini con ricotta infornata e melanzane are superb. 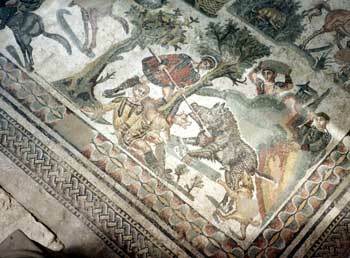 Le Caprice, Via Panoramica dei Templi 51, Agrigento, 0922/26469. Outstanding panorama of Greek temples and memorable tagliatelle con ricci di mare e bottarga grattugiata. Lo Scudiero, Via F. Turati 7, Palermo, 091/581628. Ample choice of Sicilian specialties; the coppa di crostacei is wonderful. Oliviero dell'Hotel Villa Sant'Andrea, Via Nazionale 137, Taormina, 0942/23125. Sicilian and "continental" Italian recipes mingle on the titillating menu; a favorite is risottino al bianco di cernia e finocchietto selvatico. Panificio Ingrassia, Via Dante 42, Palermo, 091/584092. Excellent bread, taralli, cookies, and more. Parco Regionale dell'Etna, Via Etnea 107, Nicolosi, 095/914588. The National Park is home to Mount Etna and a series of other natural wonders, including some fascinating wildlife. Call for information on tours and more. Pasticceria Minotauro, Corso Umberto 8, Taormina, 0942/24767. The marzipan is out of this world. Reginella Trittico, Via Principe di Paternò 126/B, Palermo, 091/345035. The fagottini di spada alla mentuccia, risottino affumicato, and cocktail di gamberi are excellent. San Domenico Palace Hotel, Piazza San Domenico 5, Taormina, 0942/23701. 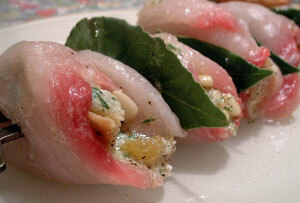 The pesce spada alla ghiotta is not to be missed. Trattoria del Carmine, Via Ducezio 1, Noto, 0931/838705. Old-fashioned recipes and family atmosphere; order the tagliatelle con erbe aromatiche or, in the winter, the antipasto di salsiccia, olive, Pecorino e pomodoro secco.